NEUTRAL COLORS, a staple in every lady's wardrobe for subtle elegance. Mix them in a handbag or piece of jewelry to broaden its usefulness . . beige and brown, gray and tan, black and camel, taupe and white. When in doubt, you can always go neutral! Elegant and exotic fan shape for evening bag, light beige fabric with gold thread pattern forms the bag below beaded top. The top front has beaded applique in channel-set clear crystals, bronze and gold beads, circles with beads in orchid, clear and red colors. Flexible cord handles are completely wrapped in golden beads with end caps, they pull up for use, flatten straight for storage or to use as clutch. Zip top, interior lined in ivory fabric with small zipper compartment. 11 inches across, 7-1/2 inches tall, 5 inches tall at center and zipper. The cut-out opening allows enough room to easily wear this on your wrist at a cocktail party (but not deep enough for shoulder wearing). Made in India. By The Artful Soul, pin set in mixed media polymer clay and resin. The 2-1/2 x 1-1/2 inch pin is a gray polymer clay background, onto which the abstract image of woman and man is handpainted with resins in pearlescent light blue, green, tan, ivory and brown/black. Earrings of the same components are 1-1/4 inches long, very light, surgical steel post about 1/4 inch below top edge. 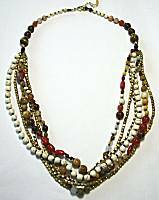 By The Artful Soul, 18 inch beaded necklace in rich woodland colors of brown, burnt orange, forest green adn black. Up to 3/8 inch wide, the stones include MOSS AGATE, CARNELIAN, TIGERS EYE, BLACK ONYX, ZEBRA JASPER, carved POPPY JASPER, cloisonne glass, and sterling silver. Toggle clasp. Graceful semi-circle of colored porcelain measures about 7/8 inch across, topped with a 24kt platinum edging, then a custom pewter hanger. Suspended below sterling silver french earwire, 1-1/4 inches long overall. Canyon colors are earthy browns, sapphire blue, blue-gray and black with occasional red flecks. Graceful semi-circle of colored porcelain measures about 1/2 inch across, topped with a 24kt platinum edging, then a graceful long-neck custom pewter hanger. Suspended below sterling silver french earwire, 1-3/8 inches long overall. Torrent colors have quadrants of teal blue/green, dark red, olive and browns. Slim stroke of color held with a spiraling silver yoke, the porcelain is capped with 24kt platinum. Pendant measures roughly 3/4 inch across, 2-1/8 inches long including bail rings. Yuma colors are cool taupe-grays and ivory with red, between top and bottom bands of jet black and color spots. Colored porcelain piece about 5/8 inch wide is topped with 24kt platinum, then suspended from sterling yoke and earwire, accented on the bottom with white pearl. 1-3/8 inch dangling lenth. uma colors are cool taupe-grays and ivory with red. 1-3/4 inches long including sterling earwire, 1-1/8 inch across. Slices of lovely natural shells are captured in resin with hint of glitter like sand in the sun. The overall color is beige with gray, backed on gray mother-of-pearl shell. 1-1/2 inches long including sterling earwires, 5/8 inch across. Slightly convex leaf shape, lightweight, glimmering white backing. The artwork depicts black twigs and brown leaves on white background. 1-7/8 inches long including copper plated, nickel-free steel earwire, 3/4 inch across. The oval cut from lightweight steel is printed on both sides, depicting a snippet of painting by Shelly Hearne. 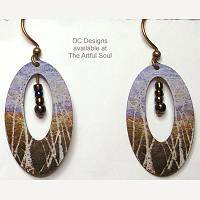 The giclee print has satin texture, birch trees motif in tans and lavender. Tiny beads dangle at open center. Folded as shown, this is about 6 inches square, it stays closed with a velcro patch. When opened it has a full zipper pocket, passport size slot, and small slot for other little papers. On the outside is another slash zipper pocket. Long ultrasuede strap adjusts in length and has lobster toggle on one side, so you can wear this around the waist, cross body, over the shoulder, under you clothes when traveling. The Sandbar fabric is woven in creamy beige and silvery gray with a bit of texture and dots. 1-1/2 inches across, 2-1/4 inches long on silverplated earwire. There are 3 wood gear shapes in graduated sizes, the 2 smaller gears spin freely on top of the largest in background. Tinted in colors of teal blue, sand and plum-red. About 60 x 8 inches, great size for tying at neck, draping over jacket collar or shoulders, wrapping around head! 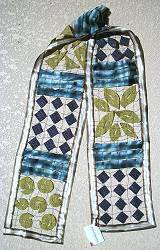 Watery dyed silk border, long stripes and overlapping bits of fabric, are joined by grid of sewn threads. This is part of Joan's "A Finer Madness" collection, where creative whimsy and tradition collide. The border is watercolor umber brown and ivory dyed silk. Black thread joins the pieces to the border. Distinctive sections are divided by a trio of silk bars in muted green-blue-grays. There are sections of squares in black/silver fabric, and sections of leaf, triangle and circle shapes in mustard gold/green print with cutout details. About 54 x 8 inches, great size for tying at neck, draping over jacket collar or shoulders, wrapping around head! Watery dyed silk border, bits of many colored and printed fabrics, are joined by grid of sewn threads. This is part of Joan's "Color Stories" collection, palettes of color to express your mood, your whim, your story. The border is dark purplish gray dyed silk. Mustard gold thread joins the squares of watercolor silk in blended colors of indigo, teal green, bronze, champagne and gray, a metallic silver/black cord winds down the center. 14mm large crystals are suspended across 3.5 inches of necklace front, spring ring clasp in back for 15-17 inch adjustable length. The crystals are set in prongs, all metal is gold plated. Crystals are CHAMPAGNE, a light gold color. 12mm crystal in prong setting dangles below leverback earwire, all coated in gold plate. 1.25 inches long. The crystal is CHAMPAGNE, a light gold color. The crystal color "CHAMPAGNE" is new for 2005, it is a foil-backed sparkler golden setting. Shown are jewelry pieces that have 3/8 inch square crystals, with black diamond accents. Bracelet has seven links joined together for 7-1/2 inch length. Earrings on leverback earwires are 1-1/8 inch overall length. Pendant comes on 16 inch chain. From an 8 x 3-3/4 inch oval leather base (no feet), the elegant bucket shape rises 10 inches tall and flares to 11 inches across the top. Pewter gray leather contrasts with light beige on top with cut-out and embossed design. Top stitch details. Inset zip top. Interior lined in black/gold scroll print fabric, small zip pocket, cell phone pocket, and credit card slots. Adjustable shoulder strap, leather on both sides with topstitching, adjusts for shoulder or cross-body lengths. This small bag is a fabulous find with its trio of 3 neutral colors. Soft black leather with tooled patterns, has cutouts to reveal the smooth chocolate brown and pebble texture gray underneath. Offwhite topstitch details emphasize the scrolls and add yet another neutral to the mix. Bag measures 9-1/2 x 6 x 2 inches, has a full zip top. Interior lined in signature black/gold scroll fabric with a small zip pocket. 24 inch shoulder strap for high shoulder wearing has double folded cords, captured to bag with chrome hardware and wrapped whipstitch detail. 2-1/8 inches long including silver covered french earwire, 1-1/8 inch across. The coated paper has streaks of gray and taupe across ivory background, with silver foil strips. Silver bugle beads and clear crystals swing freely on top. "Monarch" is big and graceful, roomy as a tote but shaped like a shoulder bag. 14 x 10 inches with curved bottom edge and curves from sides and up the middle, a contrasting fabric on the front where you can also see the piping and opening for center open pocket. Inset top zipper reveals neutral lined interior with one small open pocket. Dual straps are comfy 1 inch wide for shoulder wearing. 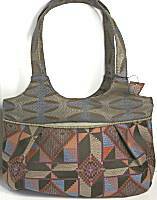 Quilt Earth squares up with dark brown, tan, blue-gray, light and dark terracotta. 7-3/8 inches long, about 1-1/4 inch wide with all the beads jutting forth from the peyote woven seed bead band underneath. Flexible and as comfortable as a ribbon draping around the wrist, the magnetic clasp is completely hidden by beads, easy on and off. Features dark natural colors of gray and natural mother-of-pearl, with black, bronze and silver beads. Nice roomy shape of bag, the large Sky Rocket has a 9.5 x 4 inch oval bottom of soft embossed gray suede leather, then panels of different leathers are tucked and gathered to billow outward about 12 x 6 inches toward center, 8 inches tall...but this all varies with the shapes of your personal items! Leather panels include gray suede with silver threads pattern, metallic platinum, satiny dark teal green. Between each panel is ribbon and braid of sparkling dark silver. The top inside edge is soft gray suede leather, that has platinum leather straps running through it so it can be gathered closed. Draping over the top edge are the triangular leather strips, all edged in ribbons, and studded with prong-set Swarovski crystals in clear color. At the end of each triangle is a soft tassel of gray silk threads. 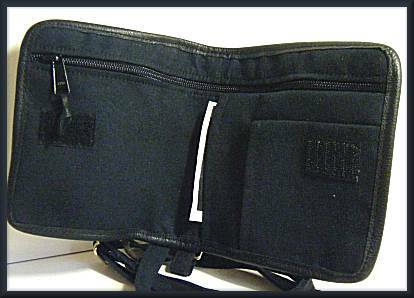 Bag closes with center magnetic snap, lined in black inside with small zip pocket. Two 36 inch platinum leather shoulder straps. 2-3/8 inches long including goldtone earwire, 2 inches across, and very lightweight! Flat weaving forms an arc suspended from tan wrapped legs that join at the top with gold wire wraps. The weaving incorporates cord colors of saddle tan, offwhite and cream. Ivory color beads are incorporated into the final row. 2-3/8 inches long on goldplated earwire, 1-1/8 inch across. Rigid metal teardrop frame is entirely wrapped in wire that stretches across the center to support rows of faceted beads. They include crystals in translucent white, champagne and bronze, then natural terracotta color of jasper. Bronze crystals dangle as fringe below. Is this dressy or earthy? We think it's both! Fixed into the curve of a stunning collar, natural color cording is woven as a background to the collar designs, then wrapped around thick cord to the back goldtone lobster clasp and extender chain. 17-19 inches around the neck, pendant is 3-1/2 inches long overall and 2-1/2 inches across. Side designs span 10 inches of front, 5/8 inch wide. Pendant is backed with soft leather, glass and crystal beads work with mother-of-pearl in medallion motif which includes light neutrals sandy beige, cream, antique gold, and minty seafoam green. 21 inches long, plus 2 more inches on golden extender chain. 3 strands of gemstone beads mix with 3 narrower strands of matte gold beads. Several of the strands are knotted with black cord between beads, adding an interesting element. The gemstones include natural colors in jasper, carnelian, offwhite howlite (or might be shell), mother-of-pearl, red coral. Altogether, the strands are about 3/4 inch thick draping around your neck gracefully.